(Bloomberg) -- As the hot start for stocks this year stretches into the second quarter, investors are beginning to question just how long the good times will continue to roll. It’s so far so good for the MSCI Asia Pacific Index, up more than 2 percent in April to follow on from its strongest first quarter since 2012. This month is traditionally the best for the gauge, which rose 77 percent of the time in April, well ahead of other months. It’s breathtaking when you pause to consider just how far stocks have come in such a short period of time. The Shanghai Composite Index is the world’s top equity market, up a stunning 30 percent this year. It returned to a bull market and more than recovered from last year’s losses, when it was the worst among major gauges. And the S&P 500 Index is once again less than 1.5 percent away from a peak, grinding higher despite much back-and-forth over a dovish Federal Reserve that was positive for markets until it wasn’t, and a yield curve inversion that sparked a short-lived sell-off. One cause for concern amid the rally is the growing disconnect between retail investors and market returns this year, according to strategists with Goldman Sachs Group Inc. 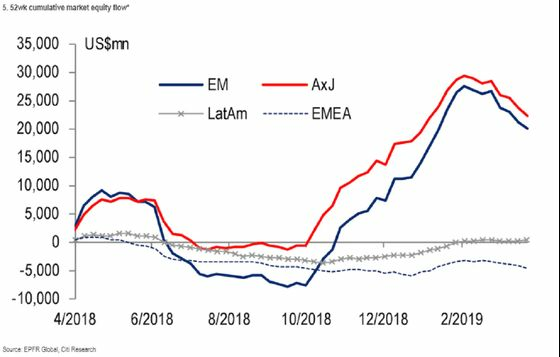 Many of them have stayed on the sidelines, with weak fund flows showing one of the biggest divergences versus equity performance since the Global Financial Crisis, strategists led by Alessio Rizzi and Christian Mueller-Glissmann wrote in a note to clients. “This metric suggests a lot of investors have not participated in the equity rally and this has increased ‘FOMO,’” or Fear Of Missing Out, the strategists said. For the week ended April 3, investors pulled $7.7 billion out of equity funds and pushed $11.4 billion into bond funds, according to a Citigroup Inc. report. Foreign investors have been net sellers of Asia Pacific stocks as well this year, exiting some $7.39 billion in equities through March 27, according to an earlier Jefferies Financial Group Inc. note. Japan accounted for most of the sell-off, while northbound investors piled into Chinese shares as the rally lived on. Another factor to consider is earnings, which are coming around once again in the U.S., with JPMorgan Chase & Co. and Wells Fargo & Co. reporting Friday, with some investors bracing themselves for the worst. In Asia, it’s already looking ominous. South Korea’s Samsung Electronics Co. posted last week its worst operating-profit drop in more than four years. The average analyst profit estimate for companies listed on the MSCI Asia Pacific Index in the next year has dropped since the start of 2019, data compiled by Bloomberg show. Technology stocks are a concern, however, as they have rallied while sales and earnings have been lowered, Darby said. The industry has such high sensitivity to the U.S. dollar and marginal demand that profits have the potential to surprise and miss by wide margins, he said.